Fifteen Years! Wow… September 2016 marks the 15th anniversary of Cynthia’s Fine Fabrics. We have come a long way and have met thousands of wonderful sewing enthusiasts along the way. What started as a dream sketched out in a journal became a reality on September 7th, 2001. We had only been open four days before that fateful day of Nine Eleven. So much has taken place since then, and sew many good things have happened at Cynthia’s too. Through the years we have endured Nine Eleven, the death of our parents, several hurricanes, and an economic collapse. But we made it! We have sponsored “Autumn in NY” twice, a fabric shopping field trip to New York City. We have sponsored PBS’s “America Quilts Creatively TV show, and advertised on Martha Stewart and Project Runway TV shows. In 2009 we added the Baby Lock brand, and in 2012 Hank received the Customer Service Award from Baby Lock at the annual dealer convention in St. Louis. 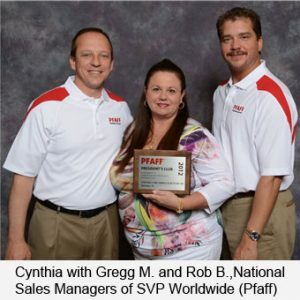 Cynthia’s has earned the Presidents Award from Pfaff Sewing Machines eight times, including 2012, 2013, 2014, 2015. We have hosted a variety of sewing stars including: Louise Cutting, Peggy Sager, Loes Hinse, Walter Floriani, Laura Hayne, Margaret Moorhead, Karen Good, Sara Moe, Susan Green Baker, plus a few more. All of this has only been possible because of our great customers. You! Because of you we will continue. So please explore our website and discover more of what we have to offer. A little about Cynthia: Cynthia has over 43 years of sewing experience. She currently holds a master’s degree in Home Economics Education and has been certified by the Home Sewing Association, Palmer Pletsch and Jenny Haskins to teach their many sewing courses. In addition, she has taught at the Art Institute in Fort Lauderdale, Pfaff International Dealer Convention and Johnson and Wales University in Miami since opening the store. Always an innovator, Cynthia attends a variety of business and training seminars annually, which include the annual conventions of SDTA, Pfaff sewing machines, Babylock sewing machines. She also regularly attends the Huston Quilt Market and The International Textile Show. She is constantly sharing any new found information with her customers through her newsletter SEW FINE, Instagram, and Facebook. Cynthia’s Fine Fabrics is a full service sewing center and fine fabrics store that offers the best of home sewing in all of South Florida.